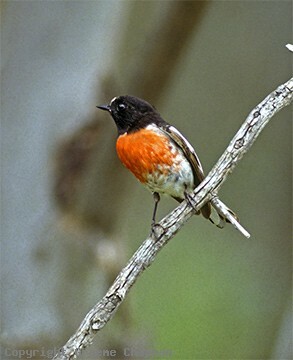 Scarlet Robins inhabit the drier eucalypt forests of southern Australia and Tasmania, ranging from the granite belt of far SE Queensland around to near Adelaide - they also occur in far SW Western Australia. They used to occur on Eyre Peninsula in S.A. but are extinct or very rare there now. 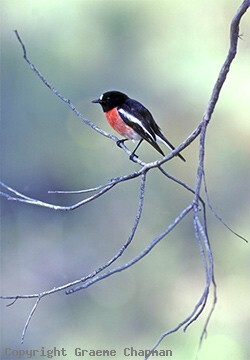 The birds that visit the Mt Lofty ranges in winter appear to be migrants from Tasmania. Scarlet Robins once adult live as pairs in permanent territories, usually in wooded areas, but in winter some birds do move out into more open country. 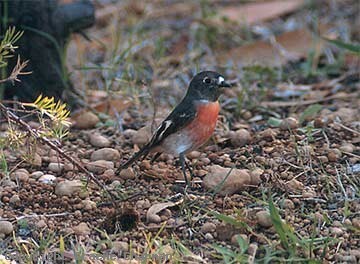 380004 ... Scarlet Robin, female of western subspecies campbelli. 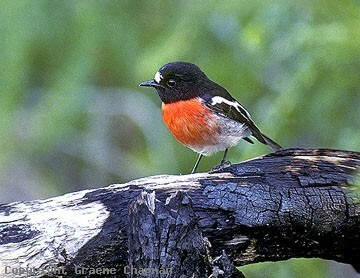 380201 ... Scarlet Robin, male, Glen Forrest. W.A.